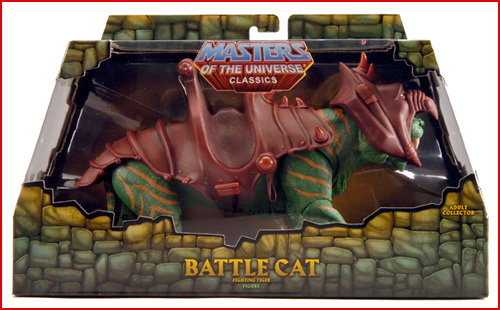 Guess the date, hour, and minute each MOTU will sell out (Battle Cat, Trap-Jaw, Man-At-Arms, and the display stands). You can also say “no sell out” if you think it won’t sell out in less than a week. In the unlikely event of a tie, the winner will be determined by a random drawing. No entries after 11:59am EDT on February 16 will be considered. Contest will end a.) on February 23; b.) whenever the last item sells out, or c.) as soon as someone has an unbeatable preponderance of accurate guesses–whichever comes first. The specific sell-out times will be determined by me, using whatever means I decide to use. If you don’t like it, don’t enter the contest. At least 10 people have to enter for me to pick a winner–otherwise it’s too easy. Power Pals are eligible this time, because I’m feeling generous. Only Ghostal family members are excluded. Winner gets a $25 Amazon gift certificate. Good luck! Hint: Don't guess the JLU stuff. Thanks for posting this Poe, mostly just cause I needed to see what was up for sale. Limited funds at the moment and I have to figure out what I want and need versus what I can probably get later down the line. I went with a faster time for Battle Cat even though I think they produced a $#!t-ton of him for this first outing to make as much of their investment in the tooling back as fast as possible. The stands I don't think will sell out. Like the DCU stands, these are something they will want to sell all the time and will have overproduced to have them in stock constantly. If they do sell out I'll be surprised. Stands = No Sell Out…. MAA – 12.34 IF it's another Skelly two-parter, 15.49est if it's not. JLU – blow-out sale in 2011….if Mattycollector is still alive then….. Display Stands I will say no sell out but I will guess the exact number sold at 12. Those stands are totally going to sell out just not right away. The completists are going to need one for every figure they have so far. And you can bet they made these in limited quantities that they won't discuss. OK, the three finalists are Wes Grogan, Eurocoin and RageTreb. Trap Jaw sold out at 12:19pm EST, while Battle Cat sold out at 12:32. Did Man-At-Arms ever actually go on sale? People were saying as much as three minutes after noon that he was sold out. @Crazy: he's actually still for sale right now. Well, while Man-At-Arms is listed as "Almost Gone! ", he's still in stock Thursday afternoon, and so Eurocoin wins!